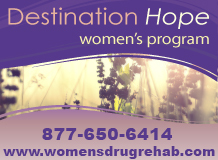 Destination Hope, 877-650-6414, is an alcohol and drug rehab for women in Fort Lauderdale, Florida. Our drug and alcohol rehab offers residential, day treatment, and outpatient programs designed exclusively for women. We also offer dual diagnosis treatment for substance abuse and depression, anxiety, abuse, trauma, and eating disorders. Our women’s addiction treatment center is an ideal place for women to recover because it is free from the distractions of co-ed programs, allowing clients to focus on their recovery. Our small program size and strong family program means that our clients receive a lot of individualized attention from our outstanding clinical staff, and we provide family therapy that heals families and save lives. Call our 24-hour helpline today and let us help you rebuild your life, 877-650-6414.